I don't remember why I was home, but for some reason I was home one weekday morning, watching the Today Show when Christopher Kimball from America's Test Kitchen/Cook's Illustrated/Cook's Country demoed some grilled foods. 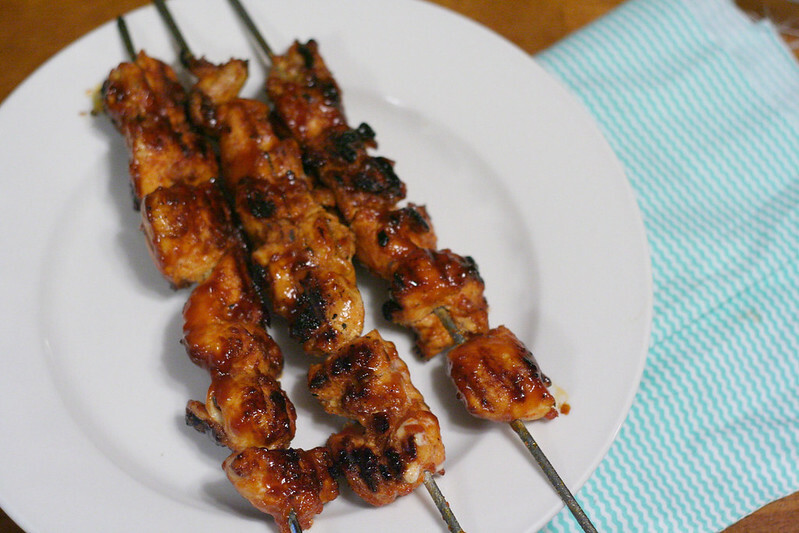 One of which was these grilled chicken kabobs, that the teaser promised used a unique ingredient. Not that I wouldn't have watched anyway, but I was certainly intrigued and anxiously awaiting the commercial break to end. Upon watching the demo I thought to myself "to say unique is an understatement!". The folks over at Cook's Illustrated decided to keep the chicken moist, but incorporate some smoky flavor and make it hold up to the high heat of a grill they's grind up bacon for a coating. Yep... a bacon paste. It's bacon, and I love bacon and chicken, so I knew this would make the list. Sadly, I lost track of the recipe, and by the time I realized it I couldn't find it on the Today Show web-Site anymore. BUT THEN, an amazing thing started happening. Fellow food bloggers started sharing the recipe and it was back in my life! I've made plain grilled chicken kabobs, using the same sauce and similar seasonings, but trust me, you do not want to sub out the bacon. It seriously takes these kabobs to a whole new level! In a large bowl toss the chicken with the salt. Cover and refrigerate for 30 minutes - 1 hour. If using a gas grill turn all burners to high and heat with a closed lid for about 15-20 minutes. Mix paprikas, sugar and cayenne pepper in a small bowl. Process the bacon in a small food processor until a smooth paste forms. 30-45 seconds, scraping down the bowl 1-2 times during processing. Pat the chicken dry with paper towels then toss the chicken with the bacon and spice mixture. Thread meat on to skewers. To make the sauce whisk together all of the ingredients in a medium bowl. Taste and season with additional salt, pepper, honey and/or hot sauce as desired. Set aside 1/2 cup of sauce for serving. Scrape the cooking grates clean with a grill brush. Leave the main burner on high and turn off the other burners. Place the kabobs over the hot burner and grill, covered. Turn 1/4 of a turn every 2-3 minutes until well browned and slightly charred (8-10 minutes roughly). Brush the top surface of the kebabs with 1/4 cup of sauce. Flip and cook until sauce is browned in spots, about 1-2 minutes. Flip again and brush with another 1/4 cup of sauce. Continue until browned in spots and cooked through. Remove from grill and rest for 5 minutes. Serve with reserved sauce.